Kaali gajar ki kanji or a fermented drink made with black carrots. Introducing a fermented drink called Kanji on this page today. Fermented vegetables can be potential healers and alternative medicine for many of your ailments that bother you. Read on if you don't believe it or haven't known it. Many people have been asking me why they get stomach cramps and IBS when they eat beans, meats and more greens like I always suggest. Everything from beans to peanuts to greens are blamed for a gassey stomach and we start abstaining from eating these nutritious foods for the fear of 'sounding' weird. Who likes a grumbling sound in the vicinity anyways. But is it just the inconvenience of the IBS or an embarrassing sound that your tummy decides to treat you with? IBS and related symptoms have greater reasons than just a 'bean' and have greater harms than just this petty discomfort. Though IBS can be due to a slight gluten intolerance too, the bigger cause is a poor gut flora. What is gut flora you would ask. And how does it get poor? We have a symbiotic relationship with a few microbes that live inside our gut. Those few are actually a few hundred species living inside our colon and a few in the cecum. So there is a living population inside our tummy that needs to keep growing and healthy. These bacteria help us 'digest' the food (talking in layman terms). Breaking down the food aiding the digestive enzymes and also synthesizing a few more nutrients that are not ingested through food. So they digest, they synthesize a few micro nutrients (particularly the Vit-B group and Vit-K*), and they make the nutrients more bio available by breaking them down, assisting our own digestive enzymes. *Intestinal microflora synthesise large amounts of menaquinones, which are potentially available as a source of vitamin K (source article). Read more about how many fermented foods we have been consuming traditionally worldwide. Modern life and processed foods have made them almost extinct. What is worse that all the added chemicals in the processed packaged food kills some of these useful gut flora, making nutrient availability poorer. A course of antibiotics does the same trick on our gut flora. The good thing is, we can still revive our intestinal flora and make them thriving with health. I am sure you eat home made yogurt regularly (packaged yogurt is made with pasteurized milk and is cultured using a standard monoculture of lactobacillus to maintain consistent taste and texture). You can also fortify the homemade yogurt with more probiotic foods (coming up another article on this page). Many of us also ferment our dosa/idli batters and bake our breads with sourdough. Instant and industrial fresh yeast is also not a good way to introduce gut flora, sourdough is excellent as it has a good spectrum of microbes. Start baking sourdough breads more and see how good taste helps in healing as well. 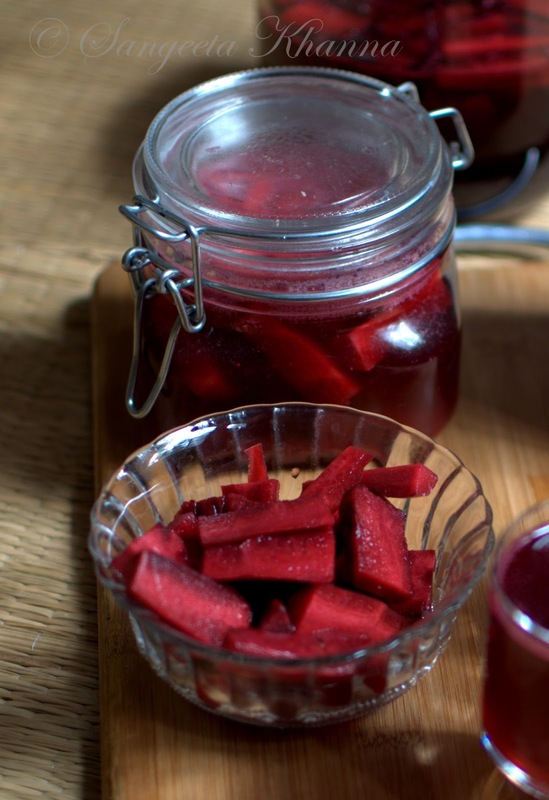 Seasonal pickles (like this radish pickle) are one of the tastiest ways to get more varied microbes for the tummy. I am telling you about a fermented drink called Kanji in the north India. 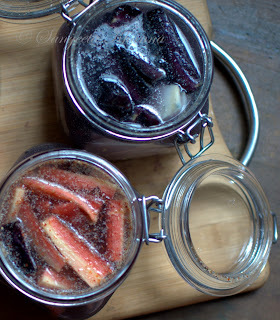 This is Kaale gaajar ki kaanji, a fermented drink made by purple/black carrots. This is an easy process, you just need to have a large glass or ceramic jar with lid. Mason jars are the best but you can do with any nonreactive jars with lids. Traditionally the jars were covered by thin muslin allowing aerobic fermentation so that can be done if you wish. The purple carrots provide a nice color owing to the presence of pigments (read antioxidants) so it is preferred for this drink. Beets work well too with a slightly changed flavor. 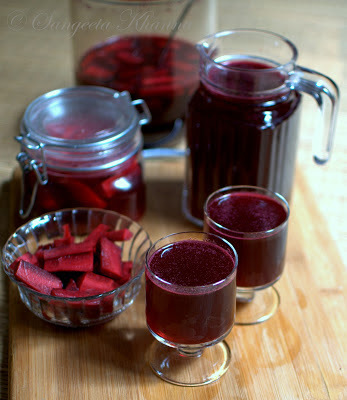 The desi red winter carrots also work well but the drink has a very dull and boring color. 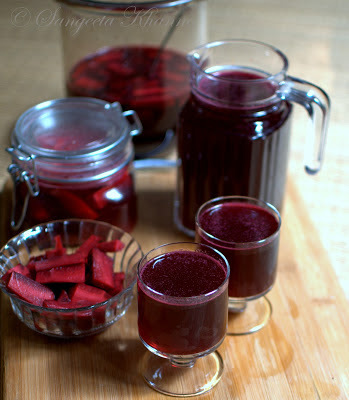 A combination of beets and carorts would work really well if you don't get purple carrots. I add a few slices of turnips too for added flavor. 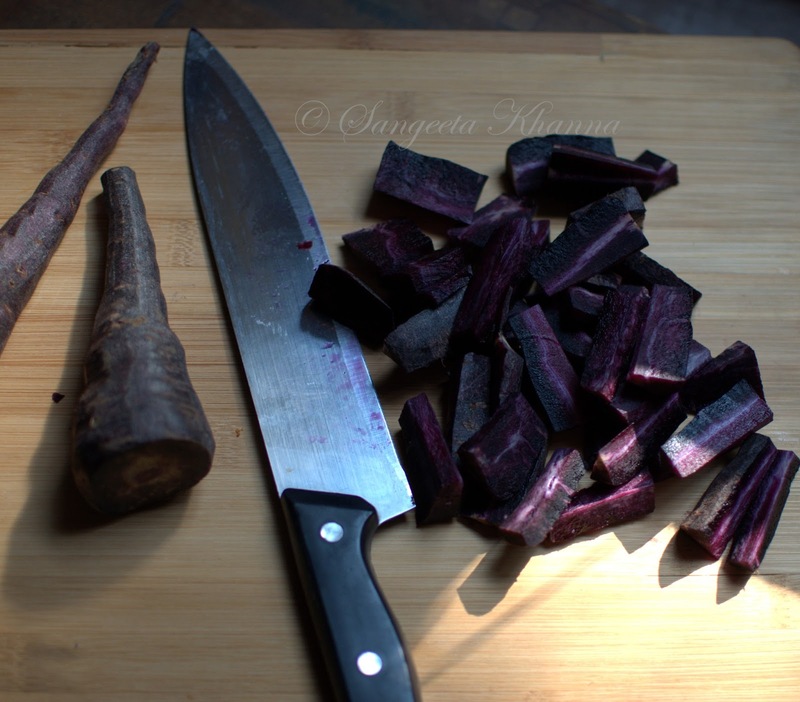 Use more of the purple carrots or beets and about 10% of turnips or red carrots by weight to get a nice color. Sterilize the jars, knives and chopping board to be used for the process. Wash, clean and chop the carrots in batons. Slice the beets and turnips too if using. Mix all the other ingredients with water and dissolve. The mustard powder will keep floating on top. Place all the chopped carrots and turnips in a glass jar or divide into smaller jars if you don't have one big mason jar. Pour the pickling solution into the jar filling it to the brim. The carrots will float initially but will submerge into the colored water by the next day. Do not worry even if they don't submerge just keep pushing them with a clean spoon everyday. These jars will be kept on a sunny windowsill or in a warm place for a week or till you taste the fermented pickling solution to be sour. Filter the dark pink/purple colored pickling solution that is the tasty drink ready for you. Adjust seasoning, you might like to add some more of black salt to the drink or some more red chilly if you like it a little hot. Fill the drink in glass bottles and refrigerate for up to a month. The pickled carrot batons can be served on the side of your meals. They make nice addition to salads and can be had independently too. Chopped finely, they can also be added to some creamy type soups or cold dips as well. The pickled carrot batons also have the probiotic benefits as these also carry the live culture. So use them freely everyday. The drink makes a nice welcome drink for your guests as well, traditionally it is served with meals just like buttermilk is served in Gujrat and some southern states and Sol kadi is served in Goa and Maharashtra. You can also soak lentil fritters (like urad daal vadas) into this fermented drink for a few hours and have it alongside your meals or as a snack. That is called Kanji vada. Other convenient ways to incorporate friendly bacteria to our foods. Pickled vegetables like cucumbers, cabbage (as in kimchi and saurekraut), Olives, chilies, onions and even garlic. The vegetables can be pickled with just some salt, they get digested by some airborne bacteria and become good probiotic food for us. Fermenting the dosa and idli batter like it is done traditionally in South India is the great way of having the grains in a more suitable way and introducing our body with some probiotic food as well. Fermented bread dough is also good but it's always better to have sourdough breads than industrial yeast. Sourdough results form natural fermentation that involves the activity of many strains of bacteria. Drinks like Kombucha, toddy, fenni* are all traditional and have been traditionally used. Many cultures use a fermented rice drink or porridge mixed with raw onions and green chilies. This savory porridge is a great way to start the day. Miso, fish/oyester sauce etc also are good prebiotic foods. Yogurt and buttermilk is the most common but pasteurized milk doesn't support many bacteria other than lactobacillus to grow and milk. I would like to hear from you if you liked this article and if you try this drink. Cheers with a healthy drink..
PS: *As pointed out by Anurag Mehrotra in the comment section, Fenni is doubted to have probiotic microbes owing to double distillation, but Urack is a better probiotic drink originating from the same cashew apple juice. 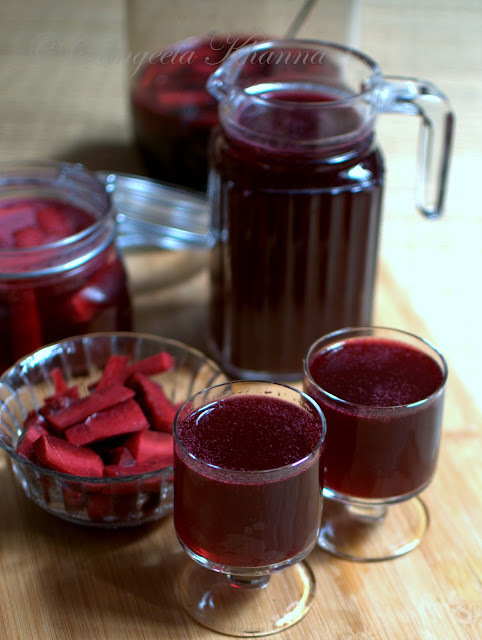 fermented foods and condiments for a healthy gut | kanji : an Indian fermented drink made with black carrots, kale gajar ki kanji..
Long time since I made Kanji..used to make it regularly when in Delhi..hard to get that dark purple carrots here, which gives the characteristic color to Kanji. Thanks for the wonderful detailed info about gut flora and the symbiotic relationship in our stomach. Informative and interesting article on fermented foods. I relish kanji and never realized that it is a probiotic. We make kanji by parboiling the carrots and usually would add double the amount of carrots. Are you sure feni is a probiotic? I am reasonably certain it is distilled twice. I think urack might be a probiotic as it is gentle on the tummy and has a shelf life. I did not have an idea that Feni is distilled twice, I had a picture of a crude distillation process that allows some contamination in the liquor as I have seen in a few tribal cultures. Urack will definitely be probiotic. I shall edit and add to the text. Thanks again. Great article! I love making kanji and am on my second batch now. Beetroot has given it a luscious color and the taste is heavenly. My hubby is nudging me to make more of it :). It really is so simple to make. And, I remember my mom diligently making it during winters. I have been making it every year since the last 3 years. Thank you for the great information. superb post sangeeta!!! I have never had this, but will make it! well explained post sangeeta. fermented foods are good for the stomach. something which i learnt in my home science days and still following. kanji with vada is a favorite and am making kanji soon with carrots and beets. we don't get the black carrots here. loved the colors in the last pic. My favourite pickle during winters! !My jar is filled and waiting to turn sour..and really a very well explained post about fermented food info! Yes Preeti, my dad used to make the gajar, gobhi shalgam ka achar and I want to recreate that since long. Might do it sometime this winter and update on the blog. We are not much of pickle eaters but small quantity will be made to recreate that experience. Wonderful! I'll be watching out for that post. Thank you. all this information is precious Sangeeta. Thanks again for sharing. Excellent post Sangi, I would like to try this for sure. Definitely wud let you know if I succeed. I got a gut feeling that I'm going to love this. Just beautiful! Very interesting, but I am not sure it'll take away the "gas problem"
True Francesco, it wont relieve the gas problem immediately but would help cure the cause slowly. But mine started tasting sour in 2 days itself!! Is this ok? Yes it is okay to have it even after two days, it will ferment faster especially if you live in warmer climate. The taste keep improving for 4-5 days and then starts getting too sour , the you can dilute it and refrigerate it too. Hello Sangeeta, Can you tell me during fermentation, Does it get some alcohol content? I mean I'm not sure if it is purely non-alcoholic. Hello Sangeeta, I have a doubt Does it get alcohol in this during fermentation like other drinks toddy and feni? I mean I'm not sure if this is purely non-alcoholic. Hi Damini, this drink might have 1-2 % or may be a little more alcohol in it but the alcohol in such drinks is not stable. Hope it helps. I was interested in trying fermented soya (kinema in Nepal, miso etc in east asian countries). I read that Soy without fermentation is actually bad for you. Any idea how to go about it or whether the started culture for this would be available in India. OK thanks. After reading on the internet on perceived problems(hormonal imbalances) people had because of overconsumption of the processed soy (raw as you mention), I thought the safest is to do it the way it has been done for 1000's of years, so go for traditional dishes as compared to modern innovations. But I guess fermentation is fermentation and should not matter much. And Soy idli is still better than raw Soy. However I would still look forward to a post on the "traditional" ways of making soy. Thanks for the wonderfull blog ! Thanks Suhas. Raw soy and processed soy is still different in my understanding. Raw soy would be bad for the phytates and few phytohormones if someone is prone but processed soy as soy lecithin and other soy protein isolates would be different in it's nutritional value and impact on health. I will definitely keep experimenting with fermentation of soy and other foods, hope it proves useful for you and others too. I really loved it. As I love Cooking, would love to see more recipes. Even I sharing a Link of 'Indian Recipes cooking show', 'Indian Cooking Recipe', 'Indian Cooking' do check. Thats a really unique recipe. Nice health benefits of kanji. Would mention it on my blog. Thanks for sharing healthy drink. I never heard this recipe before. You can use table salt in the same measure. Such a lovely article. Thanks I know I will be coming back for more. But first I plan to make kanji from the kala gajar that I picked up. I am so glad Archana that you found this Kanji recipe useful. Your feedback will be much appreciated.